Project obstacles and solutions: In November 2015, NTN Driveshaft broke ground on its new manufacturing plant in Anderson, Indiana. The facility will produce constant velocity joints for the automotive industry. Runnebohm Construction was named the general contractor for the project and Trace Construction performed all of the concrete finishing. 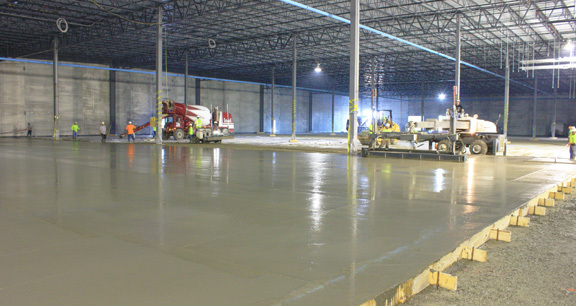 Speed of construction was very important in pouring the concrete floors in this 400,000 square foot facility. The floors were built 8 inches thick without any traditional steel reinforcement in the main sections of the floor. Instead, the floors were reinforced with steel fiber mixed integrally in the concrete. This helped speed up the construction of the floors since no reinforcement needed to be laid out and tied off prior to the pour. This saved time and labor. IMI QC/QA optimized aggregate gradations to minimize cement content. Steel fibers were used to eliminate conventional welded wire fabric. This provided reinforcement throughout the depth of the concrete. IMI supplied 10,000 yards of concrete at a rate of 200 yards per hour and 1,000 yards per day. Trace Construction was able to finish 41,000 square feet per day. They used a laser screed to move, vibrate and level the concrete at a rapid rate. The mix was designed to keep the crews moving with no down time. IMI was able to keep pace with the finishers. The combination of lower cement content, optimized gradations and steel fibers yielded a concrete design that displayed low shrinkage and curling. This produced a better finishing product with FF/FL numbers that exceeded the owner's expectations. The new NTN Transmission facility is scheduled to be completed and operational in April 2017. For more information on steel fibers in concrete, click here.